As UC San Francisco looks to construct and renovate buildings over the next several years, leaders have committed to applying lessons learned from Mission Hall to future projects. Including enclosed offices even in an open plan environment to allow for more privacy. Mission Hall, which opened in October 2014 at the Mission Bay campus, is the first UCSF building to be constructed using a type of open floorplan design called Activity Based Workspace (ABW). ABW relies on a one-size-fits-all approach to workplace design and does not include private offices. Although some Mission Hall occupants find the ABW design functional, allowing for more collaboration and bringing groups together that were once separated at different locations, a significant number of faculty and staff have been dissatisfied with the ABW environment. The primary complaint is the lack of private offices, even for senior faculty and staff. Other concerns include poor acoustics, lack of privacy and technology glitches, all of which have prevented some occupants from working effectively in the building. At a town hall meeting on Feb. 5, Executive Vice Chancellor and Provost Dan Lowenstein, MD, apologized to the faculty and staff who have experienced “pain and suffering” with their move to Mission Hall. To address the deficiencies of Mission Hall and to successfully develop alternate open plan workspace designs in future buildings, Chancellor Sam Hawgood, MBBS, formed an Open Plan Workspace Governance Task Force to develop principles for programming, designing and governing the newly developed workspace environments at UCSF. That task force consisted of representatives of Mission Hall occupants, UCSF Medical Center, Zuckerberg San Francisco General Hospital and Trauma Center, Capital Programs and Campus Planning. With urging from concerned faculty, UCSF also commissioned a Mission Hall Workplace Research Study, led by Nancy Adler, PhD, and conducted by the design firm Perkins and Will, to identify what is working and what can be improved. The study is part of a multi-year longitudinal study of workspace environments in future renovations or newly constructed buildings. The task force used the preliminary findings of the study to develop recommendations for future buildings. Read the final report by the Open Plan Workspace Governance Task Force. UCSF is seeking comments about the task force’s draft report before it is finalized and distributed to campuswide space committees, and implemented at Mission Hall. Once finalized, the report will be submitted to the Space Development Committee and the UCSF Space Committee for their review and approval at their March meetings. The task force strongly recommends that interventions be taken at Mission Hall, including making non-capital quick fixes as soon as possible and longer-term capital improvements after the report has been approved, cost estimates are finalized and funding for improvements is secured. UCSF will work with Mission Hall occupants to identify, prioritize and implement specific improvements to their work environment, Lowenstein said. Going forward, he said, the principles for programming, designing and governing developed by the task force will be applied to the construction and renovation of buildings currently in the pipeline. Lowenstein emphasized that the planning process has become and will continue to be more inclusive to get ideas and opinions from faculty and staff. The advantages of open plan workspaces are that they foster knowledge sharing and engagement and create communities by offering more spaces for collaboration and connectivity – all of which have been hallmarks of the original master planning principles of the Mission Bay campus. Psychiatry building at 2130 Third St. While the construction of some new buildings are largely financed with philanthropic support, others, like Mission Hall, must be paid for by using a combination of sources including debt financing and reserves. UCSF does not receive any state funding for capital projects, except for some money to make seismic renovations. To get the most workspace for its dollar, UCSF is moving toward an open plan workspace design for desktop environments. Open plans offer greater flexibility to adapt floor plans to expand and contract allocation of space as needed, save about 20 percent of the square footage by not having public corridors and walls separating departments, and cost less to construct at the outset and to renovate over time. Since Mission Hall, UCSF has reached out to dozens of faculty and staff on several buildings, including renovations at the Clinical Sciences Building on the Parnassus campus and the proposed building on Block 33 at Mission Bay. On Tuesday, UCSF faculty and staff kicked off the planning process for space in the new research building at Zuckerberg San Francisco General. As part of the planning process, UCSF has engaged Perkins and Will to continue to work on two fronts: to assess the functional needs of occupants destined to move into future buildings and to study employee satisfaction, engagement and effectiveness in the newly developed workspaces as part of the longitudinal research study. 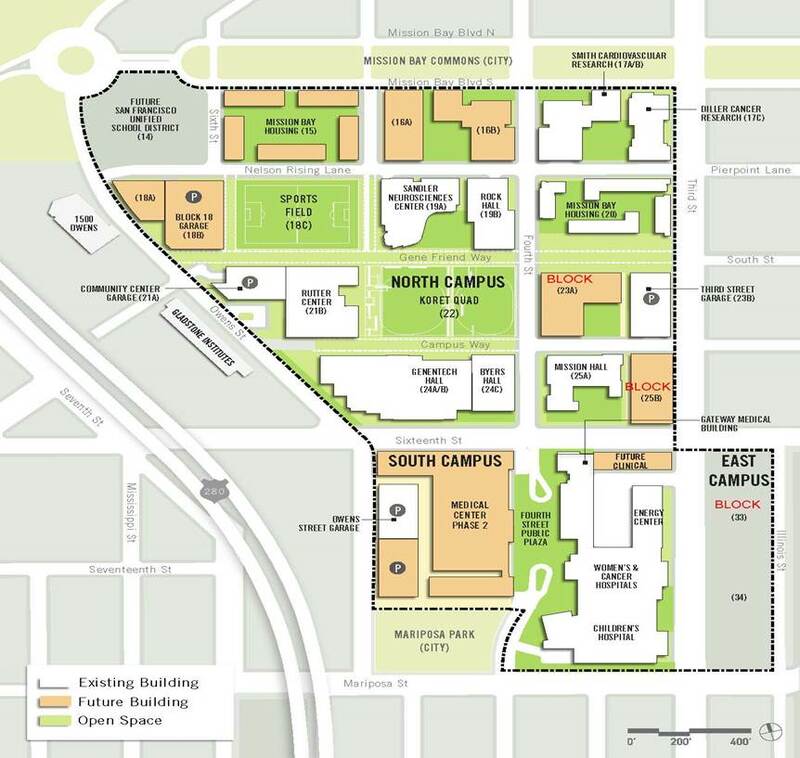 Click on the map above to see planning for UCSF's Mission Bay campus. The task force recommends that open plan workspaces should include private offices, but that they are assigned based on functional needs, rather than on a person’s title. That change itself is a culture shift for academia, requiring ongoing efforts in change management and communication. David Teitel, MD, professor of pediatrics and co-chair of the UCSF Academic Senate, who led the task force, said he believes that “open plan workspace is the way of the future for many reasons, not just cost.” He agrees that local units should decide whether offices should be single or shared, how to assign unused workstations and how to equip huddle and conference rooms. “The decision needs to reside with local functional units, groups of people working together, to be able to make their environment work for themselves, giving it the greatest chance for success,” he said.